MPs vote on Brexit – don’t panic! This week news headlines will be running into political overdrive with the latest instalment of the Brexit show as MPs vote on Theresa May’s proposed deal. Whatever the outcome, one thing we can guarantee is that the financial markets will react. How much and in what direction is entirely dependent upon the perceived impact of the vote result. If the outcome is believed to be good news for companies, the markets will move upwards, and vice versa if the news is perceived bad. Whatever happens, don’t panic! This movement in the markets will largely be driven by emotion rather than fact or detailed analysis. It’s effectively a form of market manipulation, with investors potentially making poor investment decisions, especially as they find themselves following the ‘herd’. In September 2015 it was discovered that Volkswagon had been cheating in emission tests on their diesel cars, by manipulating the system to provide false information. This scandal caused the share price to drop from 167.45 to 92.36 Euros almost overnight as investors looked to sell their shares in mass. Of those who sold their shares, how many do you think did so based upon looking at the company accounts, speaking to the CEO, understanding the growth plans of the company, and so on? The reality, very few. If they had, they would have realised that despite what the press would have you believe, the company is actually strong enough to withstand the scandal and based on the new share price could actually now represent a good opportunity. In fact, if you had ignored the negative hype and instead bought shares in Volkswagon at 92.36 Euros, you would have done very well. Just over two years later (January 2018) your money would have near enough doubled as the share price hit 183.72 Euros. Meanwhile those who sold out in September 2015 potentially made a big loss. 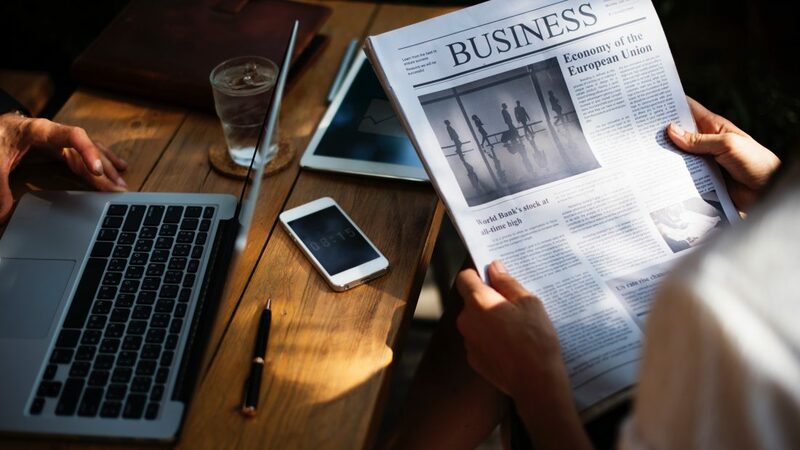 According to popular behavioural finance, human beings have an innate belief that the current status quo will continue, and we find it difficult to accept change. Hence, we struggle to make a decision and tend to initially default to doing nothing, but then act when it is too late (“status quo bias”). This behavioural bias is typical in falling financial markets. Widespread pessimism causes negative sentiment to be self-sustaining and increases as the selling continues. Eventually, when investors anticipate only more losses they react and sell at the bottom. Arguably the greatest investor in the world, Warren Buffett correctly says it’s not intelligence that counts with investing, its emotional strength. According to Warren the best time to invest is when everyone assumes a bad outcome and the negativity has become pervasive. The reason being that actual outcomes are seldom as bad as expected, yet as per the Volkswagon example, prices become more attractive. 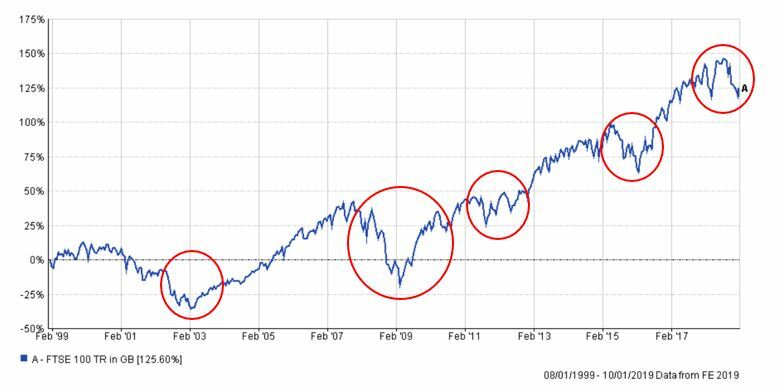 What we do know is that historically markets usually recover after a significant correction (falling market), often as quickly as they fell. Just think back to 2008. The summer of 2008 will be known for being the worst financial crisis since the Great Depression of the 1930’s. 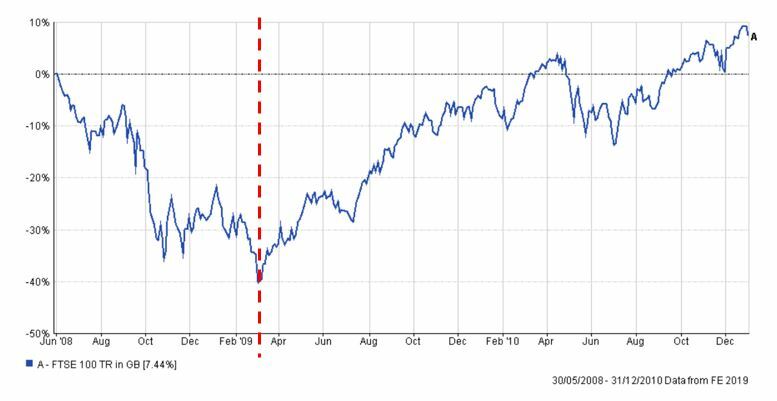 As you can see the market (FTSE 100) fell by 40% between June 2008 and March 2009. Started by the US subprime mortgage bubble, the financial crisis rapidly moved beyond the US and became a global crisis with several financial institutions either going bust or requiring bailing out. Despite the size of the crash, look at what happened after March 2009. Almost as quickly as the markets crashed, they rose again. In the 12 months to March 2010 the FTSE 100 near enough returned back to its pre-crash levels. Looking at the graph above it’s almost symmetrical. This goes to show the importance of focusing on the ‘bigger picture’, maintaining a long-term strategy when investing, and not allowing our emotions to swayed by the news headlines. To look at it another way, as we sit here in mid-January, you wouldn’t consider cancelling your July holiday to Tenerife because the weather over there is stormy at the moment. Likewise, if your investment goal is 10 plus years away, there isn’t necessarily a need to panic based upon the financial storms of today. When thinking about the news headlines it’s also important to realise that they are there to grab attention. As Bill Gates put it “Headlines, in a way, are what mislead you because bad news is a headline, and gradual improvement is not”. The best way to keep emotions in check when it comes to investing is to have a structured process in place. At Furnley House we manage our portfolios using an asset allocation framework. In simple terms this means each of our portfolios is managed against a benchmark, which acts as a guide as to what investments should be held within that portfolio. Asset types – what should the percentage split be between cash, fixed interest and equities? Market type – what should the split be between developed and emerging markets? Geographical location – how much of the portfolio should be UK based, etc. Within this framework our investment committee will then decide which individual assets to hold to further to reduce risk. For example, if we were to hold two funds that focus on UK equities, we may select one that invests in technology and another that invests in pharmaceutical companies. The advantage of using a framework like this is that it maximises diversification to ensure you’re not overly exposed to events such as Brexit. It also ensures you’re not making decisions based on emotion, or that you’re gambling on an outcome (i.e. which way will the vote go). As a result, whatever happens with the MPs vote, you won’t see a knee-jerk reaction at Furnley House. Rather we’ll just keep doing what we’ve always done. That is, helping our clients to lead the life they want to live. If you would like to speak to someone about investments or find out more about the Furnley House investment process, please get in touch. PAST PERFORMANCE IS NOT A RELIABLE INDICATOR OF FUTURE RESULTS. THE VALUE OF INVESTMENTS CAN GO DOWN AS WELL AS UP. CONTENT OF THIS BLOG SHOULD NOT BE DEEMED ADVICE OR ACTED UPON. IF YOU ARE LOOKING FOR FINANCIAL ADVICE PLEASE CONTACT US TO SPEAK TO AN AUTHORISED FINANCIAL ADVISER.